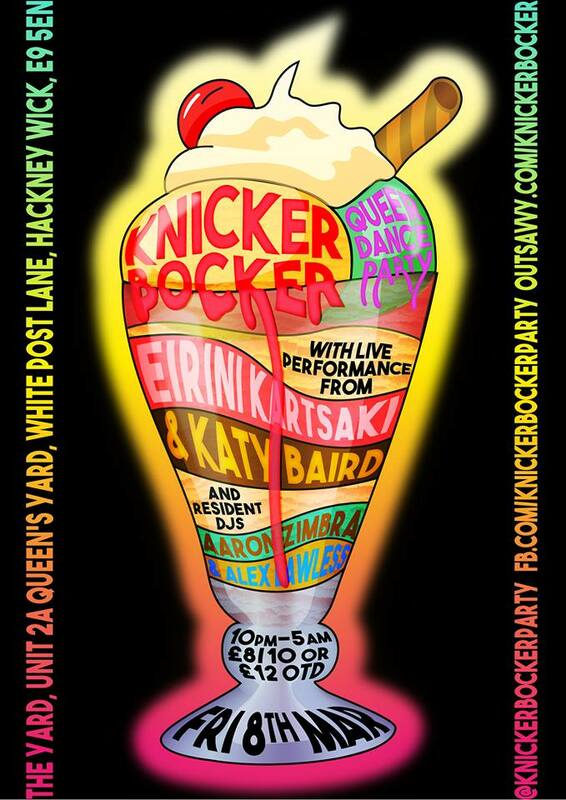 Knickerbocker returns to The Yard for another Queer Dance Party for the first time since our New Year “Extravaganza”. Come help us awaken the spring nymphs and burn those terrible NYE singlets that left you with rather more than an eyeful. We will replace the disgusting photo with a poster imminently. We are thrilled to host performance from the FANTASTIC and sometimes gross Eirini Kartsaki. Her turn at 11.00 sharp is not to be missed. And of course after an extended hiatus in the Highlands our wee artist in residence KATY BAIRD is back. She’s planning something illegal, but of course we’ll make sure she doesn’t do it. DJ wise we thought we’d have Knickerbocker residents ALEX LAWLESS & AARON ZIMBRA B2B ALL NIGHT LONG – OMFG. Shut up and play the hits boyz! They’ll be spinning Knickerbocker’s unique blend of alt-pop, indie dance, nu disco and happy, happy house. From Robyn, to LCD Soundsystem, via Grimes and Lindstrom! Tickets are on sale now and actually early birds have nearly all gone coz we put them up on outsavvy the other day, soz.